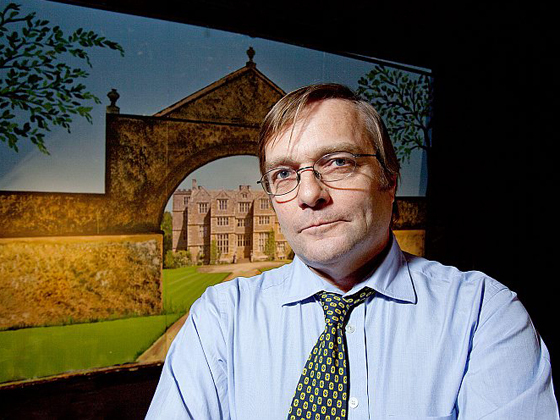 Our second season of ten talks, with one a month until next June, started with a captivating and informative evening in the company of Ivo Dawnay, Director of Communications at the National Trust, who delighted the audience with a talk with the intriguing title: Revoluntionaries in Pearls. It traced the radical origins of the trust, with the ground-breaking work of Octavia Hill, and its evolution over the decades and its ever-changing emphasis. For example, some of the current thinking is that visitors should be allowed to play pianos in some houses, or even use the snooker table - rather than the unbending Hands Off policy often dominating properties. The trust already owns 700 miles of magnificent coast, partly as result of acquisitions following the Neptune Coastline Campaign, and there are now plans to try and buy a further 200 miles, which experts consider is the extent of pristine coastline now worth saving. As much as giving a talk, Ivo wanted to use those of us in the 70-strong audience as a focus-group, gleaning opinion on issues such as the trust's attitutude towards hunting and whether it should be involved in political issues like the third runway at Heathrow or global warming. In return, Ivo was quite candid in his opinion of National Trust gift shops, with their ubiquitous lavender fragrance and uniformity, and he thought individual shops should reflect far more the properties in which they were located. He was also frank about the merits of some NT properties, but stoutly defended the controversial new Swindon headquaters, claiming it to be one of the most environmentally-sound buildings in the country. One interesting exchange involved the rector, Stephen Jones, who recalled his informal silver wedding celebrations in the gardens at Beningbrough Hall, near York, where children were allowed to play freely and there was an attractive atmosphere of responsible and relaxed behaviour. Ivo told us he was pleased that the name of Beningbrough had cropped up because his family once owned the estate and (with his tongue firmly in his cheek) recalled stories about one distant relative who, it was said, never felt the morning had really begun until he had horse-whipped a groom. Marlene Fisher again produced a remarkable back-drop, featuring a large photograph of Chastleton House, near Moreton-in-Marsh, but our design-wizard had herself painted on the main entrance-arch, as well as the manicured lawns and various bushes - so that it was impossible to spot the join. Ivo thought it was truly a work of art. We decided to film Ivo's talk, under the direction of Robin Wheeler, after the success of the YouTube we posted of last April's talk by John Lloyd and John Mitchinson, from the BBC programme, QI. It received over 1,500 hits in its first few days, whilst John Lloyd (who has been wonderfully supportive) also posted a link to our talks on the QI website, as well as alterting the 48,000 QI followers on Twitter. The proceeds from Ivo's talk were £486, adding to the £4,165 made from the first season. Some of the money has been spent painting and staining the front exterior of the 1920s timber hall, re-laying the concrete approach, removing overgrown conifers and shrubs, and replacing some of the turf. The scheme seems to have met with general approval and we think the hall looks rather smart - resembling, perhaps, The Little House on the Prairie - but much still needs to be done, including upgrading the toilets and heating, as well as work on the roof, and so we still need continuing support in the coming months in order to pursue larger grants.. Despite the rival draw of the Woodstock Literary Festival, the hall was packed and we like to think that word is now spreading about the Wootton Talks project and that many people realise that our speakers ofter top-class entertainment on a Friday evening - and that they, in turn, appreciate an attentive audience keen to ask quality questions about their work. "Blue-rinse ancestor worshippers” or “radicals with a social conscience, anxious for us to enjoy our heritage”? These were the stark questions put by Ivo Dawnay at the beginning of his excellent talk about the history and ethos of the National Trust. At the end, I think most of us felt that it was a bit of both, but we were charmed by Ivo’s friendly, informal manner, and his penetratingly clear account of the trust. He brought humour and honesty into his talk, and we appreciated his “warts and all” approach - Rev. Stephen Jones, Wootton. I had such a wonderful time at my first Wootton Talk. The village hall is charming and a lovely place for captivating talks like that from Ivo. His passion for the National Trust (and his desire to give as many of us as possible access to its properties and land) came out in his engaging, honest and very witty delivery. I can't wait to spend another evening with the charming people of Wootton and being entertained by more fascinating talks. The line-up for the next few months is very exciting - Ms Lanson Moore, Oxford.